At the beginning of this video you can see that the strings of the cello have been tied with a shoelace right below the bridge. As others have written and commented, this is almost surely meant to dampen sympathic vibrations between strings. Some players do not welcome this kind of resonance when they play. Others welcome them. As someone noticed, this is looks like a cheap color cello and you can see its bridge. A skilled luthier can select and fit the bridge (and the length of strings between the bridge and the tailpiece) in ways that dampen, enhance or balance the resonance between strings. The table is probably quite stiff with the colored finish, the bridge seems to me very done quickly, with thick feet, short head, small side peaks. 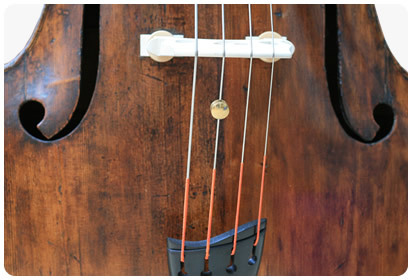 I cannot judge the bass bar and sound post but the bridge and all the rest may contribute a lot to a significant part of the string vibrations not going through the table and back, therefore a tendency to put the other strings in vibration. If it has any function at all, it would be to damp any vibration in that section of the string. It doesn't look like it would be very effective. It's also quite possible it used to hold a tag. Playing cello, should my left hand thumb clamps the neck like pliers do? Is it common to play several strings of a cello simultaneously? 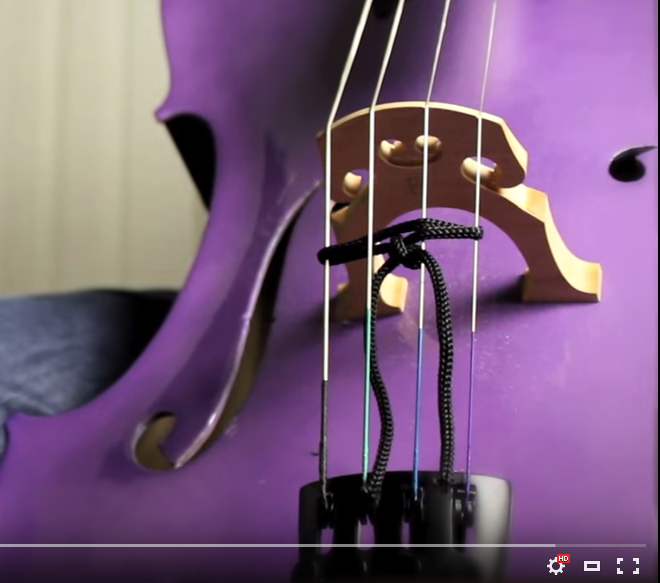 'Cello mute: how to store on strings w/o altering sound? What type of microphone is suitable for cello together with a looper pedal?